The next gaming aid describes a fantastic location to be used in your own games and adventures. You are free to use this content in your home games and modify it accordingly to accommodate to your own gaming needs. 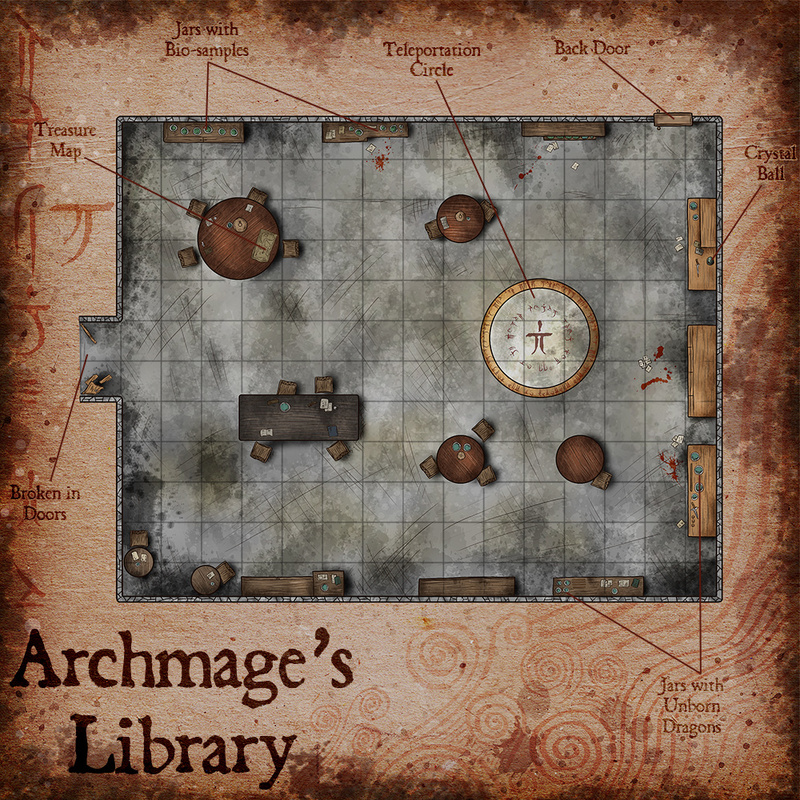 The archmage’s library is a place only accessible to the top ranking members of the Arcane College, which is the most powerful institution of its kind in the realms. Young mage apprentices and gifted children travel from afar to be taught by the great mages in the college. Most respected among them is Ardenus Toriant, the Archmage. Ardenus has lead them for ten years. The Arcane College is a stone fortress with a high tower. Contrary to common belief, the Archmage’s quarters, library and study room are not at the tower’s top. They are hidden in the vast network of tunnels and chambers underneath the fortress. Wizards do not bother walking there since there is a permanent teleportation circle right in the library. Only the Archmage and the six Senior Mages have access to it, and there are good reasons for that. That library in particular contains the latest arcane studies of those mages and the ones that came before them. They hold no qualms about forbidden magic and some forms of the art that are considered foul or inhumane. They are not bad people, at least not all of them, their only intention is to explore the secrets of the arcane from an unbiased perspective. The library is also a study room and laboratory. They have done in depth study of necromancy and resurrection magic. Permanent permutation of living beings and even blood magic. Their research and discoveries are also stored in the library. If all this were revealed, the college would face a dire situation, depending on how it happened. If it were a student who stole secrets from the library, to become more powerful, or to get access to forbidden magic, he would be in danger. The spells and rituals are dangerous to the caster if not used properly. Lone mages try to get access to the library from time to time with no success. The current situation is a real problem. The library was broken into and the Archmage is missing. Someone from the college must be guilty of treason because the burglars entered through the teleportation circle, the combination only known to the senior mages. Parts of the library were searched and are currently in disarray. There is a map on one of the tables, it describes the college’s regional area in detail, it also includes a schematic of the underground tunnels beneath the fortress. The library doors were forced open, it is assumed that whoever teleported in, walked out from the library. It is not clear what was stolen from the library, whose blood it is that stains the floor or where is Archmage Ardenus Toriant. Archmage Ardenus Toriant’s brother teleported to the library to steal an arcane tome that describes the exact process to achieve lichdom. Once inside, he met his brother and fought to death. Ardenus lost this duel, but not his life. He teleported away to save his skin. His brother broke the doors to confuse any investigator and teleported out. Two Senior mages made a terrible mistake trying to summon and bind demons. Several shadow demons appeared before them but refused to be bound by their puny spells. The mage’s escaped and kept their mouths shut. The shadow demons are still hiding in the library. A gith wizard from the astral plane wished to retrieve an arcane tome that was stolen years ago from his library. He sent a group of gith warriors and some invisible stalkers to find the tome. The gith have to wait for dawn to be able to plane shift again, so they broke the doors and fought their way out of the fortress. An arcane mishap occurred in the library, causing a hallucinatory terrain like effect. The library is in good shape and no books were stolen, it only appears ransacked to the weak of mind. The six Senior Mages of the Arcane College have mutinied. One of them seeks to replace Ardenus and has grown sick of waiting for him to die. He convinced or coerced the rest of the mages to help him. The library was the place were they betrayed him. A magic battle erupted, the odds were on their favor. Ardenus tricked them with a well timed illusion spell that distracted them long enough for him to reach the teleportation circle and get out of there. He is now in hiding and looking for muscle to help him get control of the arcane college again.